Jamaican reggae legend Jimmy Cliff stopped by the Rolling Stone studio recently to share some of his classic hits and talk about his upcoming EP, Sacred Fire. The album is a collaboration with Rancid frontman Tim Armstrong. “The vibes just flowed,” Cliff told Rolling Stone after the performance. Cliff has been making music for decades, and was inducted to the Rock and Roll Hall of Fame last year, but felt there was something left to do, even after all his success. “There was a chapter in my career that was unfinished, and so, now, I’m happy that I met Tim, that I can complete that chapter in a really good and proper way,” he said. 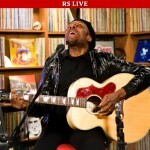 To hear more of the interview and to stream his performance, visit RollingStone.com.